My husband and I took this quiz, and Clay's top love language is Words of Affirmation, closely followed by Physical Touch. My Physical Touch ranked a big, fat goose egg. Yep, zero! Go figure. My main love languages (I had a tie because I'm complicated) are Quality Time and Gifts. Conveniently enough, the love language of Gifts ranked very low for Clay. While this produces challenges in some aspects of our relationship, it also makes us aware of the way we each receive love and offers clear opportunities to demonstrate our affection. That being said, when Christmas rolls around it's no big surprise that I'm absolutely PUMPED to shop for gifts. Ask any of my close friends or family: I'm all about buying or making a special present. If I see something that makes me think of someone, I usually can't keep from buying it, even if I'm not super close with the person! I also enjoy receiving gifts because, like I said, it's my love language; it makes me feel thought of and cared for. For Clay, on the other hand, Christmas shopping is a much more stressful experience for more reasons than the crazy crowds and credit card debt (just kidding). He strives to operate in the love language of gift-giving to demonstrate his affections, and I attempt to make it a little bit easier by contributing creative gift ideas as the holidays draw near. So for all my struggling gift-givers, fellow creatives, and art-lovers, here is a list of some of the awesome products purchased this year. From accessories to books to art-making materials, let this serve as a reference for future purchases for yourself (you deserve it), your BFF, or your sweetheart. None of these posts are sponsored; I just thoroughly enjoy all of these products and businesses. Okay, so I have never been a watch-wearer. Whether it was a watch purchased as an accessory or to keep track of heart rate or calories burned during exercise, I could not keep it on my wrist. I submitted to wristwatch defeat for years, but recently, when beginning a new job as an art teacher, I decided that a watch was near necessity. Yes, I have a clock in the classroom, but there have already been several instances in my teaching career when a wristwatch would have served its purpose. Enter MVMT. I've had my eye on this brand for about a year, but I could never justify purchasing the rose gold beauties I drooled over. Christmas seemed like just the occasion to request a MVMT watch. Y'all, besides showering and sleeping, I have not removed this watch since I opened it on Christmas Day. Clay hit the jackpot with this one. The Vela model displays standard 12-hour time, as most watches do, but also includes an indicator of the day of the week and a dual time 24-hour miniature face. I will have to admit, I haven't messed with the 24-hour time faces, but they're there if you want them! Not to mention, MVMT delivers their watches beautifully in clean, minimal packaging. Check out their watches AND sunglasses here, and follow them on Instagram to hear about sales! I can't even begin to explain how much I love the simple yet profound jewelry created by Dear Mushka. This family-owned brand is making huge strides in small business with their minimal jewelry and heartfelt message. Similar to my story as a watch-wearer, I have never been one to keep up with my jewelry. However, when I found Dear Mushka, I discovered jewelry with unique details but everyday wearability. This is my second Dear Mushka necklace I've received as a gift, and I'm constantly adding their pieces to my wishlist for future special occasions. The jewelry is well-made and high quality, and it does not irritate my super sensitive skin! Each necklace, set of earrings, or bracelet is handmade with a verse in mind. 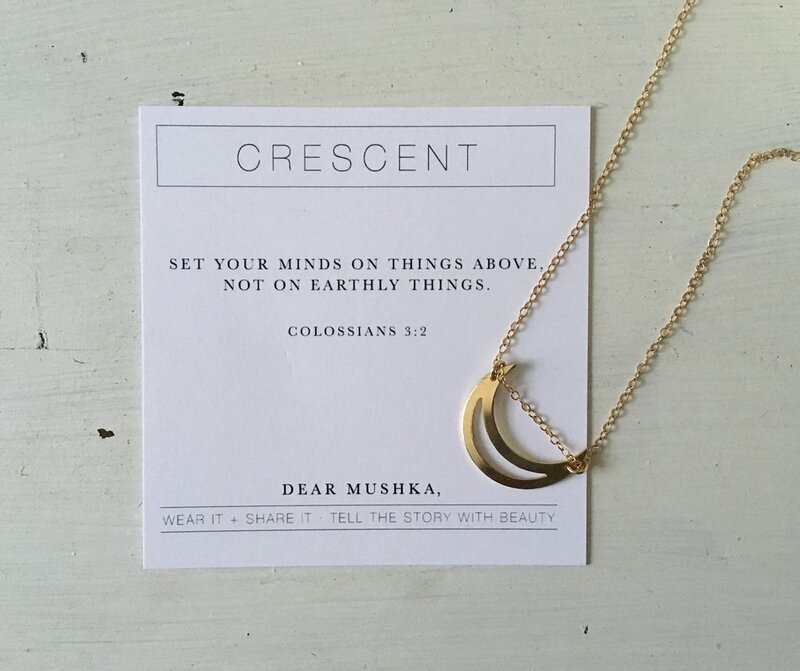 The verse for the Crescent piece is Colossians 3:2, a faithful reminder to keep your heart in the right place. Dear Mushka jewelry is handmade in Nashville, TN, and you can follow along on Instagram @dearmushka. This beautifully illustrated book by Sally Nixon hits me hard with the nostalgia of looking through I Spy books with my dad before bed. I love that this book serves not only as a fun way to play a game and get your brain working by yourself or challenging someone else, but also as a portfolio of Nixon's colorful, hand-drawn women. I love the way each girl Nixon colors has a clear personality and style. She creates detailed compositions of scenes from everyday life. I honestly just want to live inside this book. Take some time to check out Sally Nixon's work. You can find her on Instagram @sallustration and purchase her book here. I know, I know. I asked for a lot of books. I used to be a total bookworm, devouring a book in a day. Blame it on me for growing up and getting busy, or on social media, but I stopped reading nearly as much. Recently, I've been determined to change that and dive back into physical pages rather than just digital ones. I try to read a book that is either spiritual or research-based while I'm also reading a lighter, fictional book. These books would fall under the former category. Obviously, I can only review these books so much since I only recently received them. I've heard nothing but wonderful things about social scientist and author Brené Brown, and I've had Jordan Raynor's book in my Amazon cart for several weeks, the subtitle of A Biblical Invitation to Create, Innovate, and Risk piquing my interest. I've only just started reading Braving the Wilderness by Brown, but I enjoy the way she weaves research and storytelling together into one concise thought. Her books seem to center around becoming your best self and embracing everything that makes you your own human, imperfections and all. All of these books appealed to me as someone embarking on creative endeavors and figuring out where I'm going along the way. Maybe I will review one or more of these books in the future! If you use micron pens, you know how exciting it is to get a new pack of these suckers! They create such a smooth, nice line that I'm always tempted to use them for my everyday writing, but I restrain myself and save them for art-making only (most of the time). These bad boys are my favorite for pen-and-ink drawings as well as the outlines and some textural details in my watercolor pet portraits. If you or someone you know has a thing for nice pens, this is an awesome pack to start out with. I always purchase them in black, but they come in assorted colors that are super rad for bullet journaling, if you want to get fancy! I'm pretty sure I ask for a pack every year. You can purchase them on Amazon and use Prime for two-day shipping if you are in a hurry, but I typically run to my local Michael's. (I'll give you a hint: Michael's always has coupons.) They also sell them on Blick in a variety of sizes, packs, and colors. Decisions, decisions. 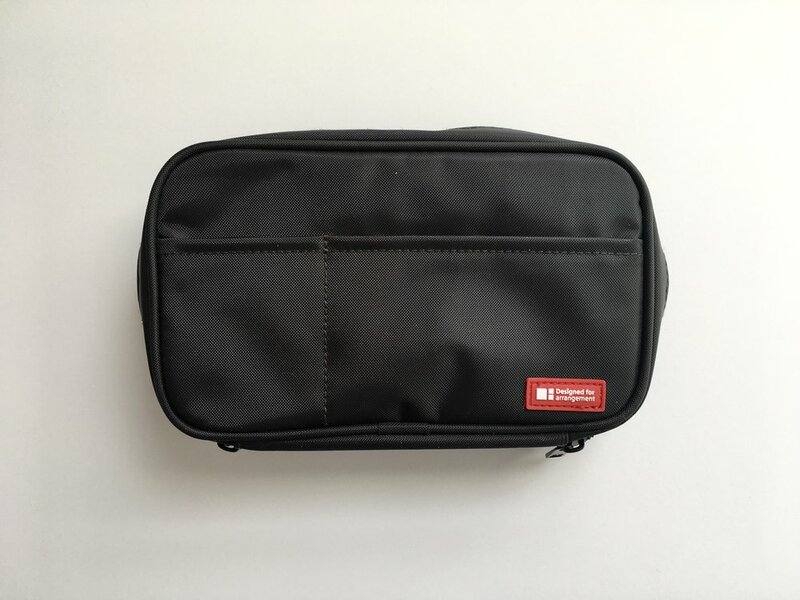 If you're going to buy some super nice pens, you might want to go ahead and grab a super nice pen case, as well! I participated in Inktober this year, creating a drawing a day through the month of October, following a list of prompts created by artist Jake Parker. Parker is an incredible illustrator, and he kindly provides a list of his favorite tools on his website. 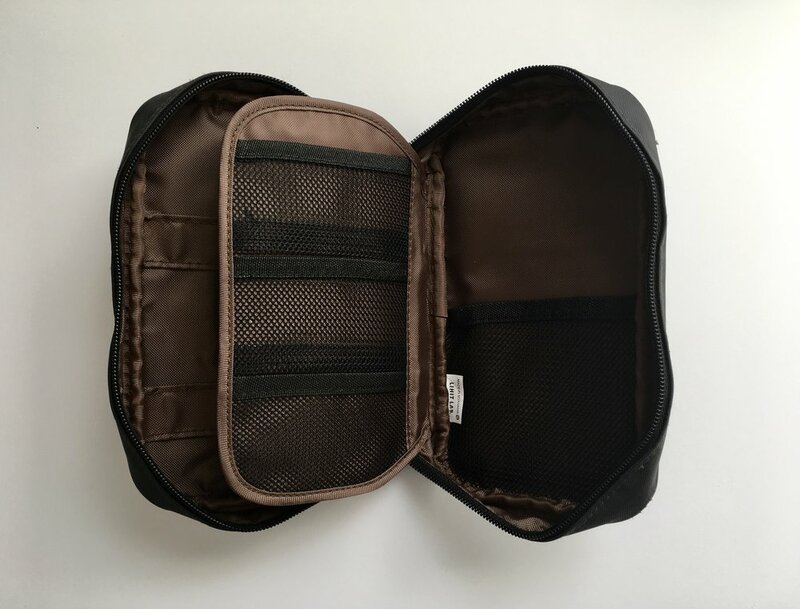 I discovered this pen case there, and boy, does this thing hold a lot of pens, pencils, and little odds and ends! As Parker states in his tool guide, this case holds way more pens than it appears like it should. It comes in fun colors like neon green, orange, and red, but as usual, I opted for the classic black. If you don't already know, I'm a neutral girl. Gray and black are my friends. The price point on this case is also top notch, and you can find it here. No, this is not a photo showing off my pristine, totally organized, guest room-turned-studio. This IS, however, showing off my new desk chair from IKEA: a chair that I completely assembled all by myself. This is no small feat, I assure you, although I'm clearly improving with each IKEA purchase I make. I thought I was perfectly happy with the chair I was using until I received this one from my parents for Christmas. Thanks, guys! My mom noticed my extremely stationary (no wheels, no swiveling-power) chair last time she dropped by our house and figured a nice desk (also IKEA) deserved an equally nice desk chair. It wasn't until I finished assembling this new chair that I truly reveled in its roll-y, swivel-y glory. Note: Extremely cute cat pillow not included. Well, that's a wrap of some of the thoughtful gifts I unwrapped this Christmas! I'm constantly making the move toward maximizing my creativity and my life through thoughtful purchases of items that will last and bring me joy. I am far from a true "minimalist", but I am constantly considering quality over quantity and looking for products from reputable businesses to support my lifestyle. I hope this list allows you to breathe a sigh of relief over gift ideas, encourages you to support a small business, or introduces you to a creative you've yet to discover.